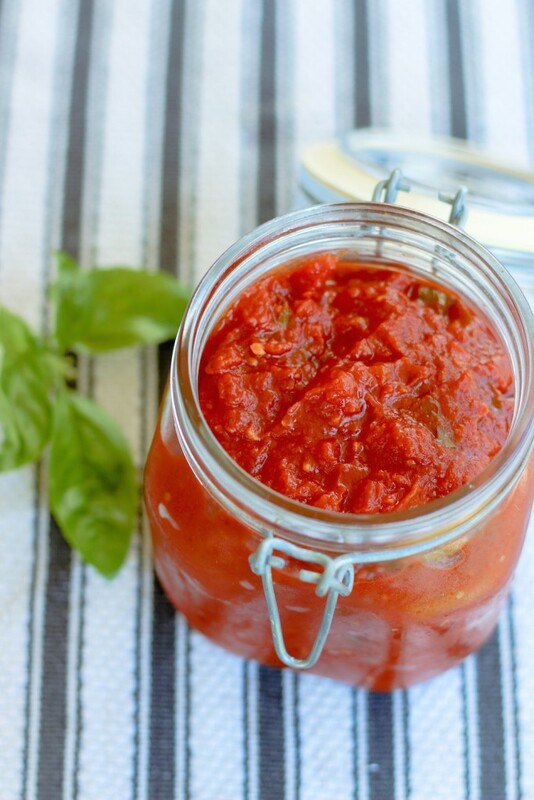 Stop buying pasta sauce in a jar. For real, knock it off. It’s so easy to make your own, right out of the pantry, at the last minute. I’m gonna give you the scoop on my basic recipe for the easiest & best pasta sauce ever, then list all the ways you can customize it depending on what you happen to have in stock in your fridge or cupboard at the moment. This recipe makes enough for one pound of pasta, about 4 servings. First, heat the olive oil in a non-stick pan. Add in the garlic (if I don’t have fresh garlic, I used the pre-diced kind in a jar, or an ice cube of frozen garlic in olive oil from the freezer) and cook for about 30 seconds- 1 minute, until the garlic is fragrant. Don’t let the garlic burn. 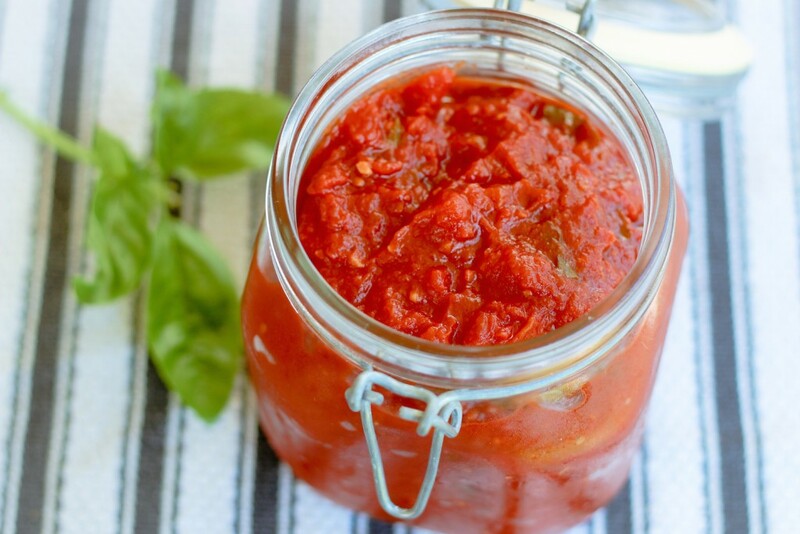 Pour in your crushed tomatoes and your diced tomatoes with their juice. Let the whole thing simmer until at least reduced by half, if not a little more. This can take anywhere from 10-20 minutes. I use a splatter screen to keep things nice and clean. If you have more time, let it simmer on a low setting for even longer. The longer it all simmers together, the tastier it gets. Remove from heat and stir in the sugar (but taste it first, it might not need the added sweetness, but it usually does when cooking with canned tomatoes) and basil, then season with salt and pepper to taste. You can pour over pasta and serve as is, and it’s amazing. Freeze whatever is leftover for another day. Once they are soft, add the garlic and proceed. Later, you can use a stick blender to puree the veggies into the sauce. Another change is to heat it up a bit by adding a tsp or so of red pepper flakes when you add the garlic. To deepen the flavors a bit, stir in any Italian seasonings when you add the tomatoes. I like to use a teaspoon of Oregano. Garlic powder and onion powder are also great. Try some funkier spices like rosemary and see how you like them! I hope y’all give this a try. It’s so much tastier (not too mention less expensive) than purchasing jarred sauce, and it becomes a fun little cooking experiment every time you make it. Let me know if you try it, or if you have any suggestions for add-ins I should try here in the prudent kitchen! the recipe is right here in the post!! !